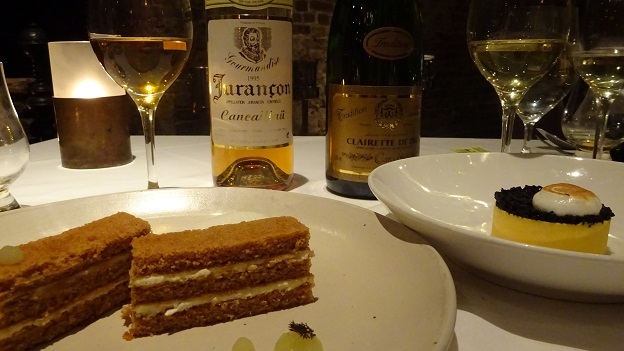 During the last decade or so, a generation of fledgling sommeliers and culinary-school grads looking for the next big thing bet on Charleston, South Carolina, and boy did they make the right call. According to 77,000 readers of Condé Nast Traveler, Charleston is currently their favorite city in America (and second only to Florence on the list of “Top 25 Cities in the World”), with its food scene a major part of the draw. Charleston is a gorgeous town, rich in meticulously restored Georgian and Greek Revival houses and carefully tended pocket gardens, with ample historic trails, quiet cobblestone alleys and waterfront real estate to keep you exploring for days. And the natives are as obliging as advertised. Nightlife, though, at least for visitors, is largely nonexistent, apart from some bar-hopping and, between Spoleto festivals, a limited music scene. So the real action is at the dinner table. The locavore obsession here is so keen here that suppliers are apt to be given equal billing with the dishes on the menu. 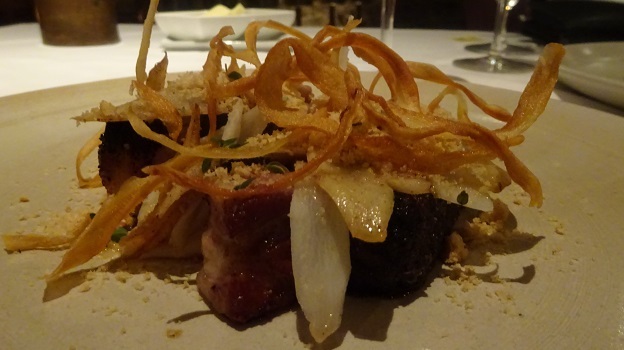 The menu at McCrady’s restaurant, perhaps the most innovative in town among the high-end spots, is a case in point, its daily-changing food selections printed alongside a roster of farmers and stockists. The same fix on regional products and culture is evident in executive chef Sean Brock’s recently published cookbook, Heritage, as well as in his second restaurant, Husk, which offers a more traditional presentation of “lowlands cuisine” (I’ll review Husk in the near future). Before I reel off the highlights of our meal I should mention two additional features that make Charleston a particularly seductive food destination. First. the settings are lovely. Many of the city’s restaurants are housed in landmark historic buildings, and these venues generally manage to blend antique and modern elements without being precious. 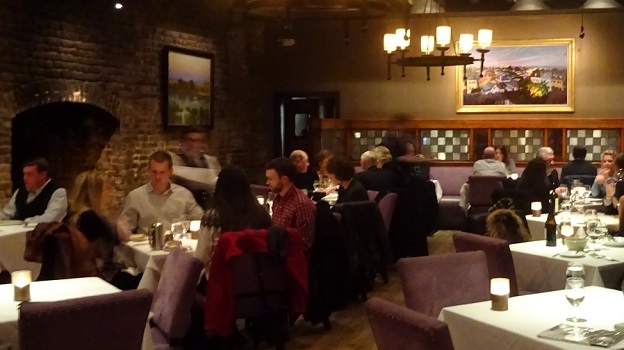 McCrady’s, for instance, tucked away on block-long Unity Alley, began life in the late 18th century as a tavern whose kitchen addition, a high-ceilinged “Long Room,” with exposed brick walls and Tudorish beams, now serves as the main dining hall. Second, the somms are willing to experiment and dedicated to making unexpected matches. 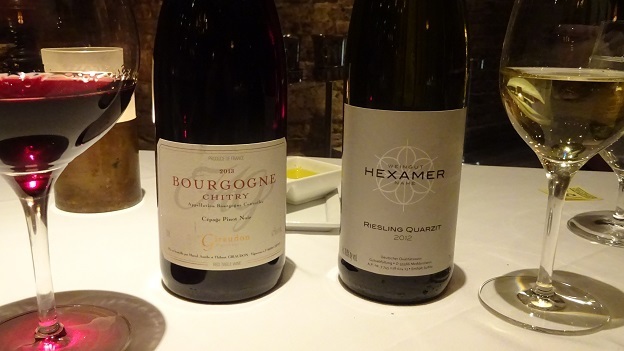 At McCrady’s, my wife and I happily selected the Sommelier’s Paired Selections, which I often do at restaurants that take their wines seriously. For this writer, it’s like a mini-vacation not to have to read the wine list. On our evening at McCrady’s, Cappie Peete and her assistant Jodi Bronchtein shared the pairing duties. Keep in mind that folks in Charleston take their meat very seriously, and a warm spot is reserved in their hearts, literally and figuratively, for pork. (The three main courses offered on this evening were beef, pork, and grouper, but even the fish had a brush with some pork fat). In other words, if you’re offered the house charcuterie, go for it. The chef at McCrady’s will send out an amuse-bouche course of five “snacks,” which might include, if you’re lucky, silky shavings of cured local ham on popcorn crisps, rich duck sausage with apricot, blue corn blini with crème fraîche and a dollop of tiny crystalline Sunburst trout roe, or perhaps a rennet-like custard made of celtuce—a lettuce whose stalks taste something like celery—sprinkled with basil buds. Taste combinations throughout were inspired and provocative. 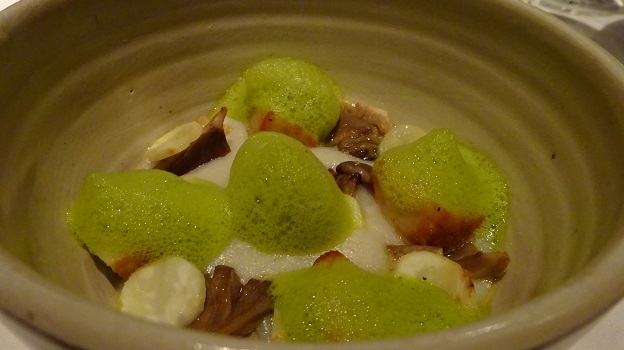 Starters included local sea scallops served in a creamy porridge of Charleston golden rice—it’s nutty and small-grained—with oyster mushrooms and celeriac. The slight residual sugar of the Vouvray brought out the natural sweetness of the scallops and the wine’s acidity cut through the rich rice component. Easily the showiest coupling of the night was a dish of delicate blue crab in a tart grapefruit vinaigrette with shaved butternut squash, served beside an emerald-green pool of kale juice with pear, dill oil and yuzu that read like a jolt of pure chlorophyll.The minerally Patrick Piuze Val de Mer Chablis contrasted with the sweetness of the crab while amplifying the spiky green notes in the vinaigrette and kale juice. Filet of grouper was accompanied by Napa cabbage done (naturally) in pork fat and other sautéed brassica greens including included bok choi, mustard greens and fermented cabbage. 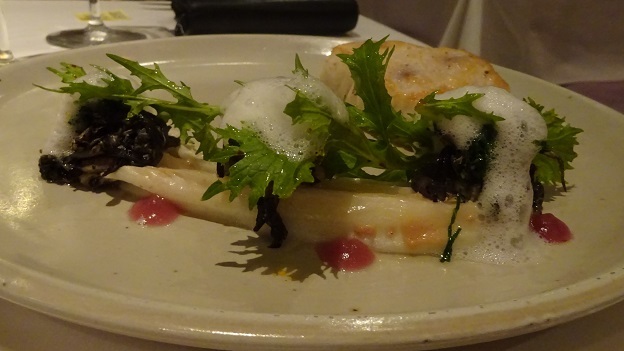 The fresh sweetness of the grouper was balanced by the acidity and crunch of cold pickled clam and topped by a foam of clam juice with a bit of the pickling liquid and country ham fat, and accented with daubs of red onion gelée. The saline umami notes of the dish were nicely mirrored by the concentrated, minerally Hexamer riesling, with the wine’s slight sweetness adding another layer of interest. Berkshire (as in Virginia, not Massachusetts) pork loin was prepared au poivre (with four kinds of peppercorns, for those of you who are keeping count) with salsify, almond and thyme. My dinner partner’s ecstatic verdict: “Some pig!” The low-tannin pinot from Chitry made for a smooth pairing. This was on all counts a comfort dish. Desserts here are determined not to be cloying. To wit: Pumpkin panna cotta tinged with bitter orange puree and overlaid with burnished black malted barley. Superbly restrained ginger layer cake with apple and anise. And the standout of the evening: Puddingy soft milk chocolate and caramel sobered up with—wait for it—parsnip juice and topped with a toasted crunch of grilled pecans and parsnip crisps. 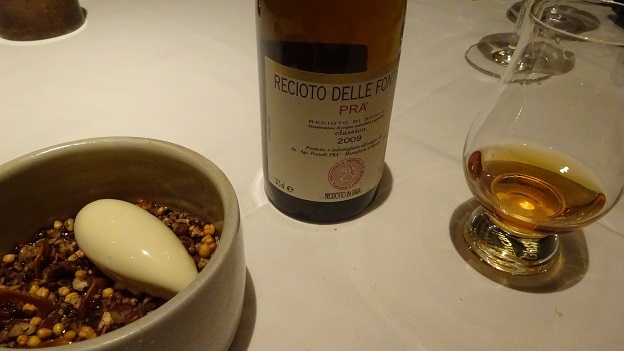 Combined with the honeyed white fruits of the Prà Recioto di Soave, it made for a decadent offering that I would have ordered again had cooler heads not prevailed.